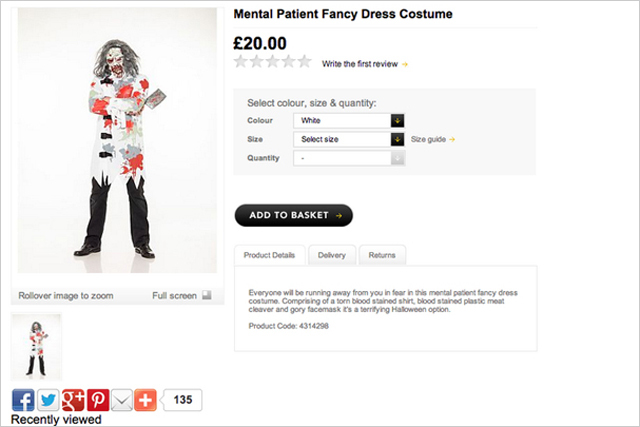 Asda has been forced to withdraw a "Mental Patient Fancy Dress Costume" from its website, after facing criticism on social media sites. The supermarket listed the product, including a "torn blood stained shirt", fake blood and a fake meat cleaver, on its Asda Direct site for £20. Asda advertised the Halloween costume with the line: "Everyone will be running away from you in fear in this mental patient fancy dress costume." Mental health campaigners, including Charity Rethink Mental Illness, were quick to challenge the retailer, demanding on Twitter that Asda "please explain" why it was listing the product. The costume was quickly withdrawn from sale, and Asda promised it would make a "sizeable" donation to mental health charity Mind to apologise. It said in a statement on Twitter: "We removed the product from our website this afternoon but unfortunately the page may remain visible for a few more hours. "We're deeply sorry one of our fancy dress costumes has upset people. This was an unacceptable error – the product was withdrawn immediately." Following the controversy, Tesco has also agreed with withdraw a "Psycho Ward" Halloween costume from its website. The bright orange boiler suit has the word "committed" written on the back. Tesco apologised for "any offence caused". We'd like to offer our sincere apologies for the offence it's caused and will be making a sizeable donation to @MindCharity. We're deeply sorry one of our fancy dress costumes has upset people. This was an unacceptable error - the product was withdrawn immediately.